After enjoying the 2016 superbloom at Death Valley, we crossed the Panamint Range to go to the Antelope Valley State Poppy Reserve near Los Angeles. On the way, we hoped to find the cotton-top cactus, like the ones my wife spotted above Mosaic Canyon. 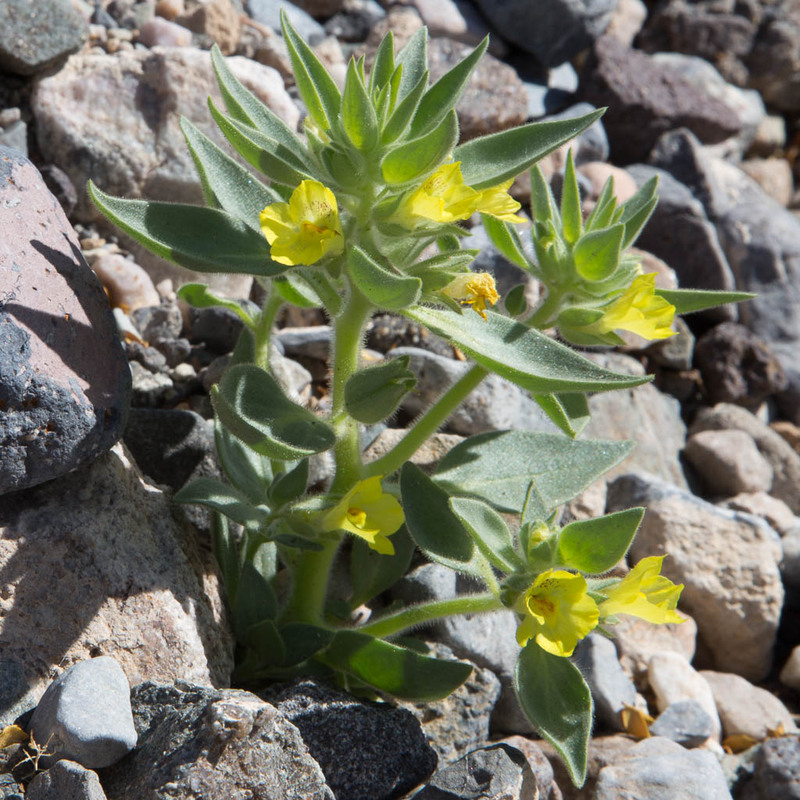 According to Mojave Desert Wildflowers, the cotton-top cactus “occupies rocky slopes and ridges from 2,000 feet to 5,000 feet”, and we would drive through this zone. 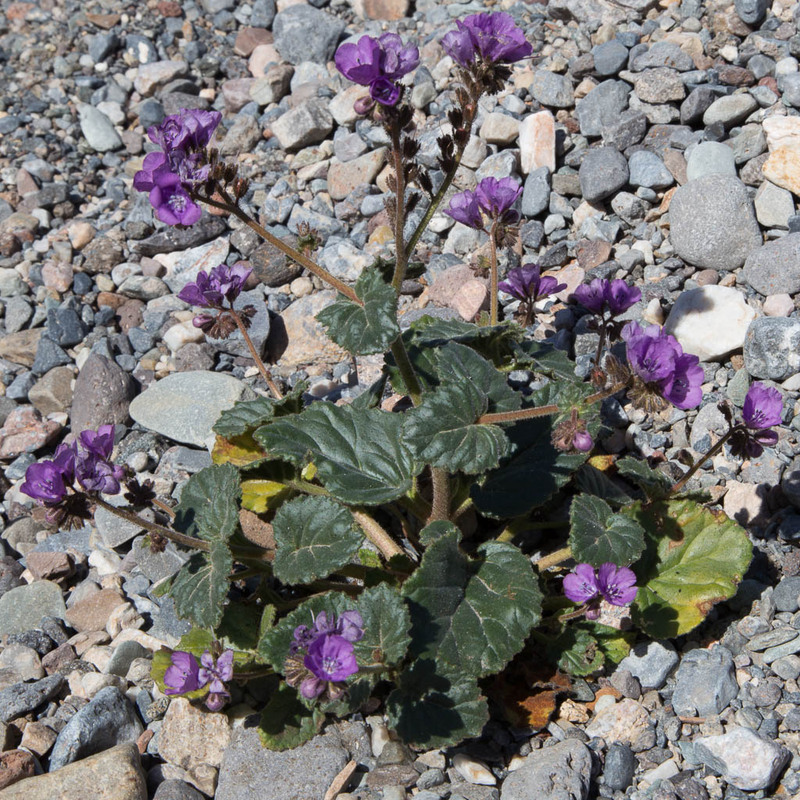 On the west side of the Panamint Range, we saw some pink clumps. We pulled off the road and walked up the hillside. 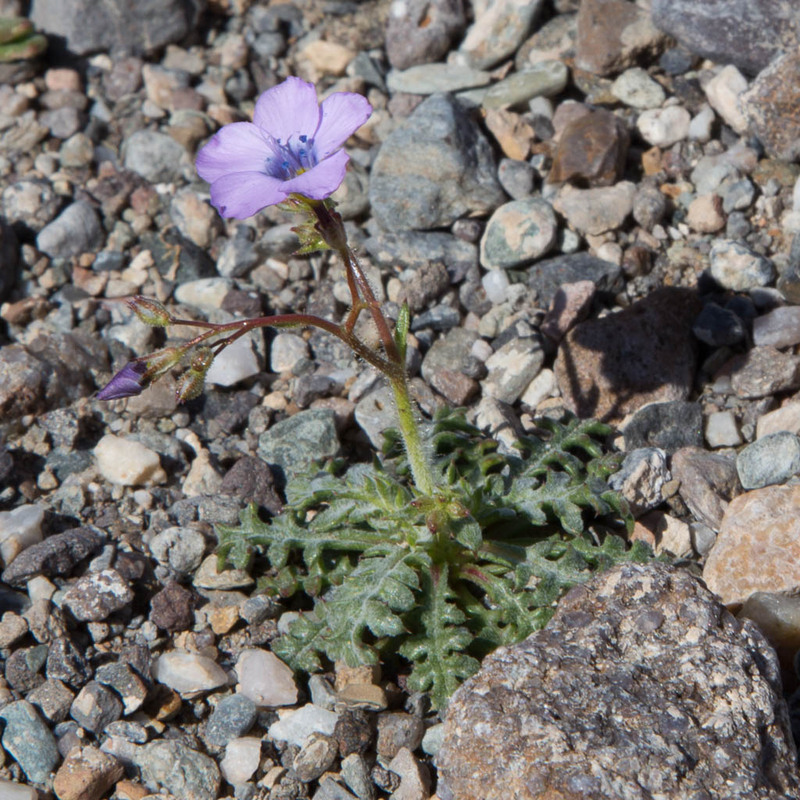 We were rewarded with new wildflowers that we hadn’t seen at Badwater Road and Beatty Cutoff Road. Above, a car speeds past notch-leaf phacelias (phacelia crenulata). At a shutter speed of 1/40 second, the speeding car is a blur behind the phacelia. Click on any photo to view a larger image. All plants are California natives. Plant descriptions are from Mojave Desert Wildflowers. 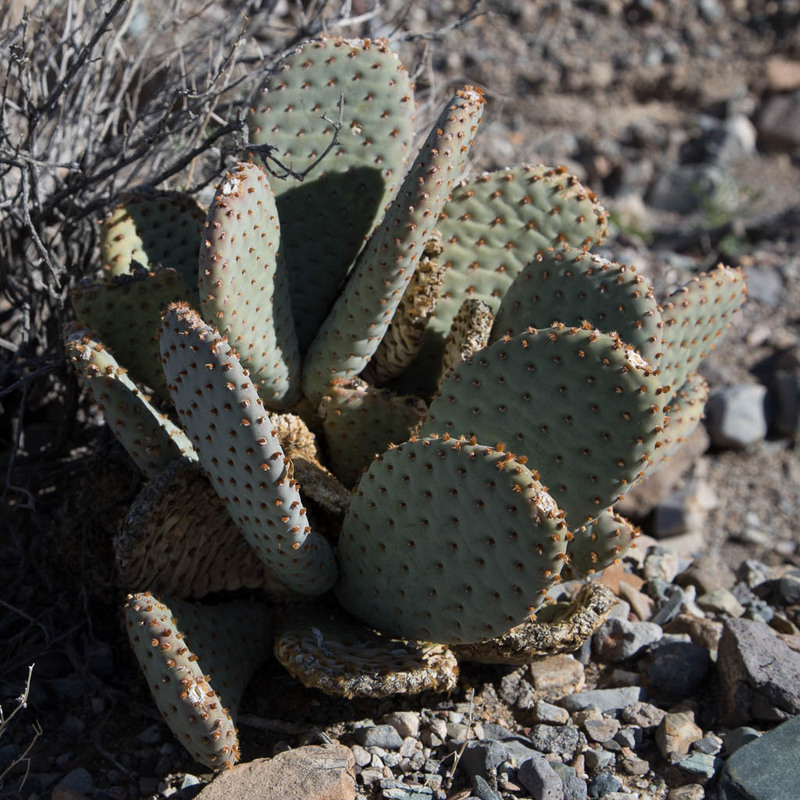 This beavertail cactus (opuntia basilaris) is out in the open. We found a cotton-top cactus (echinocactus polycephalus) like we had seen at Mosaic Canyon from afar. As the book said, this spot with the cotton-top is between 2,000′ and 5,000′. The book notes that “several members of its genus are extremely attractive and sought after for horticultural collections”. I read this as plantnappers! 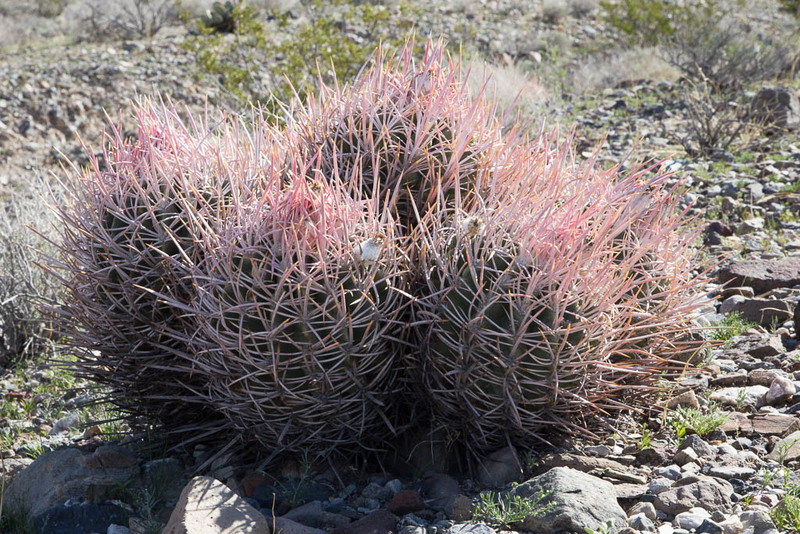 The cotton-top may resemble a small barrel cactus, but unlike the single barrel, the stems occur in clumps of 10-30. Each 1′-2′-tall stem has 10-21 ribs and is usually 8″-14″ in diameter. The following are new for us. The broad-flowered gilia (gilia latiflora) has lavender flowers. The basal rosette leaves of this 4″-12″-tall annual are toothed or lobed and have cobwebby hairs. … Loose clusters of 1″-long lavender flowers with protruding stamens, a tubular throat, and spreading lobes with white bases are produced on the upper stems. We had seen young lesser mohavia (mohavea breviflora) without flowers at Beatty Cutoff Road, but we couldn’t be sure until we saw one with flowers. This erect, glandular, 2″-8″-tall annual has alternate, ovate, leaves on short stalks. The deep-yellow flowers have upper and lower flaring, fan-shaped lips and maroon spots on the swollen bases of the lower lip. And finally, we saw a caltha-leaf phacelia (phacelia calthifolia). This isn’t in Mojave Desert Wildflowers, but it is in Jepson. First the bad news –the hot weather and lack of rain had already stressed our lower elevation flowers to the limits. Then the wind came. A vicious windstorm tore through the valley over the weekend, and devastated many of the lower elevation flowers. The flowers along Badwater Road are only a shadow of their former glory, and the fields along Highway 190 were hit hard, also. Life in Death Valley can be hard and short. I really like the cactus you found. Our family took roundtrips through the west when I was young on visits to my grandparents in Colorado. I have a soft spot for the desert scenery. You two are like a couple of sleuths searching out the flower types with your clues and maps. The car speeding past the notch-leaf phacelias looks like it belongs in a travel magazine. Enjoying your blog. Yes, the desert and the high country have a simple, austere beauty. The land is so harsh that only the plants and animals adapted to that climate can survive. I really like the speeding car photo, even if it was dumb luck. The photo conjures up a story — the people on their way to Death Valley don’t know they’re passing wildflowers that we couldn’t find there. Looking for wildflowers and wildlife is like a treasure hunt, where you don’t know what you’ll find, and that’s part of the adventure.